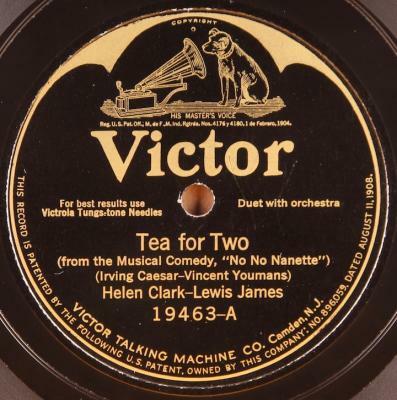 Choice copy of fine vocal duets of great 20s standards by pioneer recording artists and musical theatre stars, Helen Clark and Lewis James. Condition: E+/E,E+; Plays great, generally nice quiet surface. Nice clean copy aside from a bit of very, very light rubbing/scuffing on “I Want To Be Happy” and tiny rim chip to one side, not near grooves. Otherwise very clean copy.